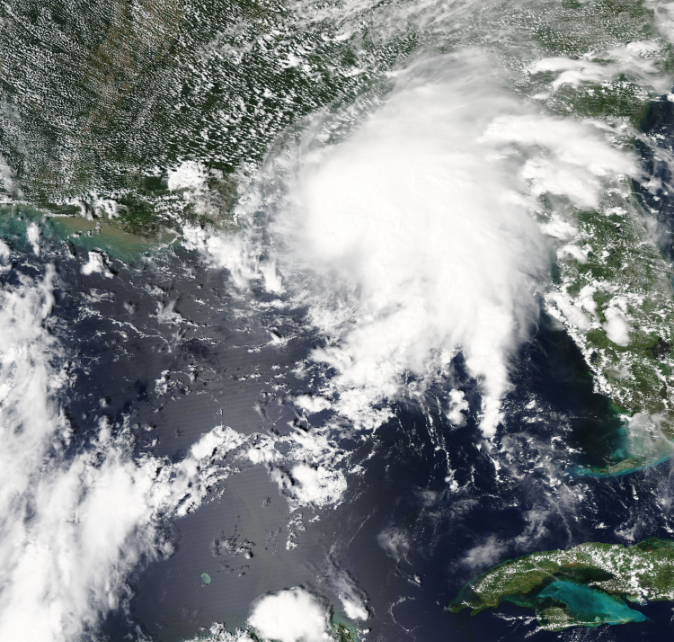 A NASA satellite image of Tropical Storm Gordon shows the storm beginning to reach landfall. Alabama Power said that by 7 a.m. CDT, about 21,000 customers were without power, mostly in the Mobile metro area. The majority of the outages across the region were in Alabama. Alabama Power said in an update on the power outages that its crews were working in areas where it was safe for them to do so. Mississippi Power said on its website that only about 275 customers remained without power at 7:15 a.m. CDT. At the height of the storm, more than 27,000 customers across the region were without electricity, mostly in coastal Alabama, southeast Mississippi and the western tip of the Florida Panhandle around Pensacola. Gordon has weakened to a tropical depression and is expected to continue weakening as it moves inland. The U.S. National Hurricane Center says the storm's maximum sustained winds decreased Wednesday morning to near 35 mph (55 kph) with additional weakening expected as it moves inland. Gordon never became a hurricane before making landfall just west of the Alabama-Mississippi border late Tuesday. But it was still deadly, killing a child when a tree was blown onto a mobile home in Florida. Forecasters say the threat of heavy rains and flooding continues along with the possibility of a tornado.